Time flies by really fast, and here we are, back again to celebrate our 57th Independence Day, or as we Malaysians know it: Selamat Hari Merdeka (Happy Independence Day). Every year, our Prime Minister Dato’ Seri Najib Tun Razak advises that every business and household put up the Malaysian flag to show our patriotism and respect for the nation on August 31. Every year, our Merdeka celebrations are as big as the New Year’s Eve countdown celebrations with fireworks displays, parades, and entertainment. The Malaysian flag to fly on August 31, 2014, on Independence Day. Photo by Waikatomalaysians. 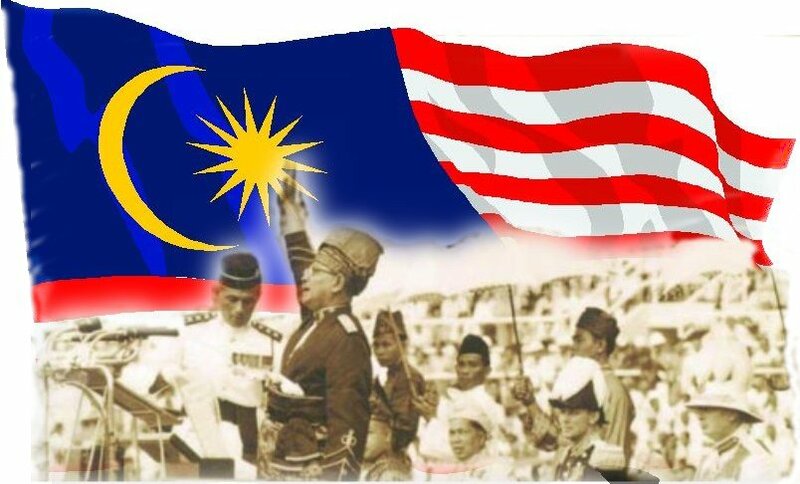 Our nation’s independence took place thanks to our first Prime Minister of Malaysia (then known as Malaya), Tunku Abdul Rahman Putra Al-Haj. He opened up negotiations with the British officials in London to ask for the independence of Malaya together with a delegation of ministers, political leaders, the first President of the Malayan Chinese Association (MCA), Tun Tan Cheng Lock, and the fifth President of the Malaysian Indian Congress (MIC), Tun V.T. Sambanthan. Once it was confirmed that the Communist threat during the Malayan Emergency had ended, an agreement was reached on February 8, 1956 for Malaya to finally gain its independence from the British ruling. However, the official proclamation of independence was decided that the declaration would only be announced the following year due to unforeseen circumstances. Tunku Abdul Rahman returned home from London with the good news that Malaya will finally achieve its long-awaited independence. In the years between 1955 and 1957, our first Prime Minister and his cabinet prepared the Malayan Constitution and discussed how the administration of justice would be carried out. They cemented racial harmony back into the veins of the country and resolved to defeat the Communists. On August 31, 1957, Tunku Abdul Rahman led the nationwide roar to shout out “MERDEKA!” seven times at the newly-built Merdeka Stadium. It was a truly remarkable scene at the time of the incident. “As the nation is still mourning the MH17 and MH370 tragedies as well as sharing the losses suffered by families of victims, we need to modify the Merdeka celebrations this year. In the midst of the celebrations, the nation will also commemorate MH17 and MH370 tragedies as the incidents deeply affected Malaysians.” – The Star Online. Nevertheless, we are still ready to celebrate the birth of independence for our country. Get your flags ready and let’s all sing the National Anthem: ‘Negaraku’. Remember to stand up, guys! SELAMAT HARI MERDEKA (HAPPY INDEPENDENCE DAY) from all of us at Posterific!